Be the first to share your favorite memory, photo or story of Geraldine "Jerri" . This memorial page is dedicated for family, friends and future generations to celebrate the life of their loved one. 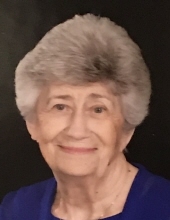 Geraldine Slusher Norton, 88, Oak Ridge, passed away on November 24, 2018. Jerri was born on December 31, 1929 in Red Bird, Kentucky. She was an active member of Robertsville Baptist Church where she sang in the choir and held positions on several of the committees, including the personnel and pastor search committees. She enjoyed reading, sewing, and working crossword puzzles. Husband, Robert Norton; Son, James Norton; Grandson, Christopher Grissom; Brothers, Ernest and James Taylor; Sister, Linda Berry, Son-in-law, Mike Grissom. Sisters, Patricia Ray, Knoxville; Martha Litton, Kingston; Henrietta Elliott, Oak Ridge; Six grandchildren and 4 great-grandchildren. To send flowers or a remembrance gift to the family of Geraldine "Jerri" Slusher Norton, please visit our Tribute Store. "Email Address" would like to share the life celebration of Geraldine "Jerri" Slusher Norton. Click on the "link" to go to share a favorite memory or leave a condolence message for the family.